3 Two more TLDs have been assigned, but to date not used: .sj for Svalbard and Jan Mayen; .bv for Bouvet Island. The Kingdom of Norway, commonly known as Norway, is a Nordic country occupying the western portion of the Scandinavian Peninsula in Europe, bordered by Sweden, Finland, and Russia. Norway has a very elongated shape; the country's extensive coastline along the North Atlantic Ocean is marked by its famous fjords. The Kingdom also includes the Arctic island territories of Svalbard and Jan Mayen: Norwegian sovereignty of Svalbard is based upon the Svalbard Treaty, but this does not apply to Jan Mayen. Bouvet Island in the South Atlantic Ocean and a claim for Peter I Island in the South Pacific Ocean are also external dependencies, but these are not part of the Kingdom. Norway also claims Queen Maud Land in Antarctica where it has established the Troll permanent research station. Norway plays a significant role in the pursuit of stability and world peace, through the "Norwegian Model," utilizing the four aspects of strategic alliances, international cooperation, foreign aid and third party mediation in international conflicts. Norway comprises the western part of Scandinavia in Northern Europe. The rugged coastline, broken by massive fjords and thousands of islands, stretches over 15,535 miles (25,000 km). 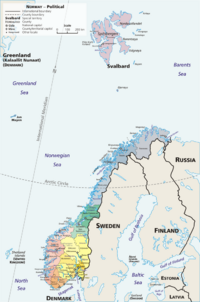 Norway shares a 1,580 mile (2,542 km) land border with Sweden, Finland, and Russia to the east. To the west and south, Norway is bordered by the Norwegian Sea, the North Sea, and Skagerak. The Barents Sea washes Norway's northern coasts. At 125,020 square miles (323,802 square kilometers), (not including Jan Mayen, Svalbard, and other overseas possessions), Norway is larger than both Italy and Great Britain, but somewhat smaller than Germany. It is about the same size as the U.S. state of New Mexico. Norway is a very rugged country, characterized by a great variety of natural features caused by prehistoric glaciers and varied topography. The most renowned are the fjords, steep grooves cut into the land that flooded with water. The largest of these is Sognefjorden. Norway also has many glaciers and waterfalls. The land is mostly made of granite and gneiss rock, but slate, sandstone and marble are also common, and the lowest elevations have marine deposits. Due to the Gulf Stream current and prevailing westerlies, Norway experiences warmer temperatures and more precipitation than expected at such northern latitudes, especially along the coast. The mainland experiences four distinct seasons, with colder winters and less precipitation inland. The northernmost part has a mostly maritime subarctic climate, while Svalbard has an arctic tundra climate. There are large seasonal variations in daylight. In areas north of the Arctic Circle, the summer sun may never completely descend beneath the horizon, hence Norway's description as the "Land of the Midnight Sun." During summer, inhabitants south of the Arctic Circle still experience sunlight nearly twenty-four hours each day. View of the valley Nærøydalen from the Stalheim. The rounded mountain at the left hand side of the valley is Jordalsnuten. Archaeological finds indicate that there were people in Norway as early as the tenth millennium B.C.E. (twelve thousand years ago). They probably came from more southern regions, from what is now northern Germany, then traveled further north along the Norwegian coastline. In the ninth century, Norway consisted of a number of small independent kingdoms. In 872, according to tradition, Harald Fairhair gathered these kingdoms into one in the Battle of Hafrsfjord. He became the first king of a united Norway. The Viking age (eighth to eleventh centuries) was one of unification and expansion. The Norwegians established settlements on Iceland, the Faroe Islands, Greenland, and parts of Britain and Ireland, and attempted to settle at L'Anse aux Meadows in Newfoundland, Canada (the "Vinland" of the Saga of Eric the Red). The spread of Christianity in Norway in this period is in large part attributed to the missionary kings Olav Trygvason (995–1000) and Saint Olav (1015–1028), although Haakon the Good was Norway's first Christian king. Norse traditions were slowly replaced during the ninth and tenth centuries. The old Icelandic annals report that the Black Death came to Bergen, Norway, in 1349 with a ship from England. The annals say that two thirds of Norway's population died. This is most likely an exaggeration. (The estimated mortality was approximately 33 percent in England and on the continent.) However, whatever the number, the result was a decline in Norway's way of life. In 1387, during this decline, the Fairhair dynasty died out. Royal maneuvering among the Nordic countries eventually brought the thrones of Norway, Denmark, and Sweden under the control of Queen Margrethe when Norway joined the Kalmar Union with Denmark and Sweden. Sweden declared its independence in 1523, but Norway remained under the Oldenburg dynasty for 434 years until 1814. During the national romanticism of the nineteenth century, this period was by some referred to as the "400-Year Night," since all of the kingdom's royal, intellectual, and administrative power was centered in Copenhagen, Denmark. However, the common people of Norway typically had more freedom and paid lower taxes than the Danish people because the distant Norwegian provinces were more difficult for the royal bureaucracy to control. Other factors that contributed to Norway's decline in this period include the introduction of Protestantism in 1537. As a result, the archbishopry in Trondheim was dissolved, and the church's incomes were distributed to the court in Copenhagen in Denmark. Norway lost the steady stream of pilgrims to the relics of St. Olav at the Nidaros shrine, and with them, much of the contact with cultural and economic life in the rest of Europe. Additionally, in the seventeenth century, Norway saw its land area decrease with the loss of the provinces Bohuslän, Jemtland, and Herjedalen to Sweden, as a result of the wars between Denmark–Norway and Sweden. After Denmark–Norway was attacked by Britain, it entered into an alliance with Napoleon, and in 1814 found itself on the losing side in the Napoleonic Wars. The Dano-Norwegian Oldenburg king was forced to cede Norway to the king of Sweden. Norway took this opportunity to declare independence, adopted a constitution based on American and French models, and elected the Danish crown prince Christian Fredrik as king on May 17, 1814. However, Sweden militarily forced Norway into uniting with Sweden, establishing the Bernadotte dynasty as rulers of Norway. Under this arrangement, Norway kept its liberal constitution and independent institutions, except for the foreign service. This period also saw the rise of the Norwegian romantic nationalism cultural movement, as Norwegians sought to define and express a distinct national character. The movement covered all branches of culture, including literature (Henrik Wergeland, Bjørnstjerne Bjørnson, Peter Christen Asbjørnsen, Jørgen Moe, Henrik Ibsen), painting (Hans Gude, Adolph Tiedemand), music (Edvard Grieg), and even language policy, where attempts to define a native written language for Norway led to today's two official written forms for Norwegian: Bokmål and Nynorsk. Christian Michelsen, a Norwegian shipping magnate and statesman, was Prime Minister of Norway from 1905 to 1907. Michelsen is known for his central role in the peaceful separation of Norway from Sweden on June 7, 1905. Norway's growing dissatisfaction with the union with Sweden during the late nineteenth century combined with nationalism to prompt the dissolution of the union. After a national referendum confirmed the people's preference for a monarchy over a republic, the Norwegian government offered the throne of Norway to the Danish Prince Carl and Parliament unanimously elected him king. He took the name of Haakon VII, after the medieval kings of independent Norway. In 1898, all men were granted universal suffrage, followed by all women in 1913. During World War I, Norway was a neutral country. Norway also attempted to claim neutrality during World War II, but was invaded by German forces on April 9, 1940 in Operation Weserübung. The Allies also had plans to invade Norway, in order to take advantage of the strategically important Atlantic coast, but were thwarted by the German operation. Norway was unprepared for the German surprise attack, but military resistance continued for two months, longer than in either Poland or France. 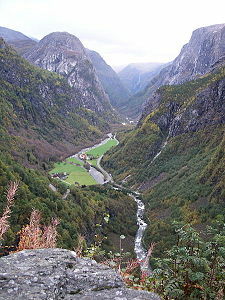 The battle of Vinjesvingen eventually became the last stronghold of Norwegian resistance in southern Norway in May. The armed forces in the north launched an offensive against the German forces in the Battles of Narvik; they were forced to surrender on June 8 after the fall of France. King Haakon and the Norwegian government continued the fight from exile in London. On the day of the invasion, the collaborative leader of the small National-Socialist party, Nasjonal Samling, Vidkun Quisling, tried unsuccessfully to seize power. Real power was wielded by the leader of the German occupation authority, Reichskommissar Josef Terboven; Quisling, as "Minister-President" later formed a government under German control. During the five years of Nazi occupation, Norwegians built a strong resistance movement which fought the German occupation forces with both armed resistance and civil disobedience. More important to the Allied war effort, however, was the role of the Norwegian Merchant Navy. At the time of the invasion, Norway had the third largest, fastest and most effective Merchant Navy in the world. It was led by the Norwegian shipping company Nortraship under the Allies throughout the war and took part in every war operation from the evacuation of Dunkirk to the Normandy landings. In December each year, Norway gives a Christmas tree to the United Kingdom, to express gratitude for the UK's assistance during World War II. A ceremony takes place to erect the tree in Trafalgar Square. Following the war, the Social Democrats came to power and ruled the country for much of the cold war. Norway joined NATO in 1949, and became a close ally of the United States. Two plebiscites to join the European Union failed by narrow margins. Norway is a constitutional monarchy with a parliamentary system of government. The Royal House is a branch of the princely family of Glücksburg, originally from Schleswig-Holstein in Germany. The functions of the King, Harald V, are mainly ceremonial, but the King retains influence as the symbol of national unity. Although the constitution of 1814 grants important executive powers to the King, these are almost always exercised by the Council of State in the name of the King. However, the reserve powers vested in the Monarch by the constitution are significant and were last used during World War II. The Council of State consists of a Prime Minister and other ministers, formally appointed by the King. Parliamentarism has evolved since 1884 and requires that the Cabinet have the approval of the Parliament, and that the appointment of the Cabinet by the King is a formality only when there is a clear majority party in Parliament. But after elections resulting in no clear majority to any party, as has happened for the last twenty years or so, the King's political influence is real. In addition to heading government meetings every Friday at Oslo Palace (Council of State), the King has weekly meetings with the Prime Minister and the Foreign Minister. The King opens the Parliament every September, he receives ambassadors to the Norwegian court, and he is the Supreme Commander of the Norwegian Armed Forces and the Head of the Church of Norway. 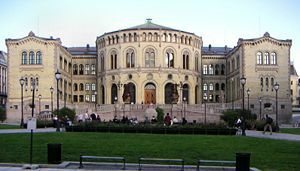 The Norwegian parliament, Stortinget, currently has 169 members (increased from 165, effective from the elections of September 12, 2005). The members are elected from the nineteen counties for four-year terms according to a system of proportional representation. When voting on legislation, the Storting – until the 2009 election – divides itself into two chambers, the Odelsting and the Lagting. Laws are in most cases proposed by the government through a Member of the Council of State, or in some cases by a member of the Odelsting in case of repeated disagreement in the joint Storting. Nowadays, however, the Lagting rarely disagrees, effectively rubber-stamping the Odelstings decisions. A constitutional amendment of February 20, 2007, repeals the division after the 2009 general election. Impeachment cases are very rare (the last being in 1927, when Prime Minister Abraham Berge was acquitted) and may be brought against Members of the Council of State, of the Supreme Court (Høyesterett), or of the Storting for criminal offenses which they may have committed in their official capacity. Prior to an amendment to the Norwegian Constitution on February 20, 2007, indictments were raised by the Odelsting and judged by the Lagting and the Supreme Court justices as part of the High Court of the Realm. In the new system, impeachment cases will be heard by the five highest ranking Supreme Court justices and six lay members in one of the Supreme Court courtrooms (previously cases were heard in the Lagting chamber). Storting representatives may not perform as lay judges. Indictments will be raised by the Storting in a plenary session. The Storting otherwise functions as a unicameral parliament and after the 2009 general election the division into Odelsting and Lagting for passing legislation will be abolished. Legislation will then have to go through two – three in case of dissent – readings before being passed and sent to the King for assent. The judiciary consists of the Supreme Court (eighteen permanent judges and a chief justice), courts of appeal, city and district courts, and conciliation councils. Judges attached to regular courts are appointed by the King in council. In order to form a government, more than half the membership of the Council of State is required to belong to the Church of Norway. Currently, this means at least ten out of nineteen members. Norway is divided into nineteen first-level administrative regions known as fylker (counties); and 431 second-level kommuner (municipalities). The fylke is the intermediate administration between state and municipality. The King is represented in every county by a "Fylkesmann." 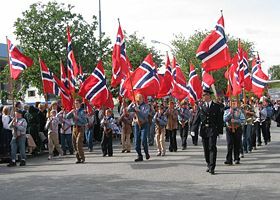 Scouts holding Norwegian flags lead a parade on the 17 May, Norway's Constitution Day. Freedom of expression is established in Article 100 of the Constitution of Norway. Freedom of religion is established in Article 2 of the Constitution, which also establishes the state religion as "Evangelical Lutheran." The press is not censored, but most editors adhere to self-imposed commandments of caution ("Vær Varsom-plakaten"). Public radio and television broadcast mostly without interference from the government, although permission to broadcast depends on the program spectrum. Broadcast advertisement is regulated, with particular restrictions on paid political messages and advertising directed at children. The constitution also forbids retroactive laws, punishment not based on laws and court decisions, and the use of torture. Norway abolished the death penalty for regular criminal acts in 1902. Capital punishment for high crime during wartime was abolished in 1979. In 2005, the international conventions against discrimination of women and race discrimination were incorporated in to (but not made superior to) Norwegian law. Homosexuality was officially decriminalized in 1972 and homosexual partnerships legalized in 1993. According to Statistics Norway (SSB), 192 homosexual partnerships were recorded in 2004. Since 2002, it has become possible for homosexual partners to adopt each other's children from previous relationships, although joint adoption is yet to be allowed. Norway has compulsory military service for men. Conscripts are drafted at age 18 for initial service of between six to twelve months. Service may begin at age 17 with parental consent. After completion of the initial service period, personnel are transferred to reserve units, which may be called up for periodic training until age 44. Conscientious objectors serve 12 months in an alternative civilian national service. If a candidate refuses to attend the assessment of fitness, where any objections to future military service are to be stated, he is liable to prosecution. A person who is deemed fit for service and who is not a conscientious objector but still refuses military service is also liable to prosecution. Changes to the structure of the armed forces has resulted in a lower demand for conscripts; the number of males eligible to serve is decreasing as well. Since the end of the Cold War, Norway has developed a model to foreign policy known as the "Norwegian model," the goal of which is to contribute to peace and stability through coordinated response among governmental and non-governmental Norwegian organizations; acting as an honest broker in international conflicts; an informal network of Norwegian individuals with access and credibility among parties; and the willingness to take the long view in international issues. Norway's strategic importance for waging war in the North Atlantic became important in the failed neutrality policy of World War II. Norway became a founding member of NATO in order to ally itself with countries that shared its democratic values. Both through diplomatic and military cooperation, Norway has played a visible role in the formation and operations of NATO. 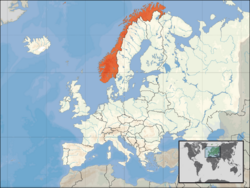 It allowed a limited number of military bases and exercises to be based in its territories, which caused some controversy when NATO decided to put forward bases in Northern Norway in preparation for a conflict with the Soviet Union. Norway supports international cooperation and the peaceful settlement of disputes, recognizing the need for maintaining a strong national defense through collective security. Accordingly, the cornerstones of Norwegian policy are active membership in NATO and support for the United Nations and its specialized agencies. Norway also pursues a policy of economic, social, and cultural cooperation with other Nordic countries, Denmark, Sweden, Finland and Iceland, through the Nordic Council, Its relations with Iceland is very close due to the cultural bond the two nations share. Norway ended a two-year term on the UN Security Council in January 2003, and chaired the Iraq Sanctions Committee. Norway is the only Scandinavian country that is not a member of the European Union. Membership has been proposed within Norway, and referendums over Norwegian membership were held in 1972 and 1994. Popular opinion was split between rural and urban areas. The present government has tabled the possibility for future membership. Norway also has a history of co-operation and friendship with the United Kingdom, due to their shared cultural heritage since Viking times. Norway's Embassy to Britain is located in London, and it also maintains a Consulate General in Edinburgh. In addition to strengthening traditional ties with developed countries, Norway seeks to build friendly relations with developing countries and has undertaken humanitarian and development aid efforts with selected African and Asian nations. Norway has played an active role as a third party mediator in a number of international conflicts. The late foreign minister Johan Jørgen Holst was instrumental in forging the Oslo Accords between Israel and the PLO. Thorvald Stoltenberg was part of the mediation team in seeking an end to the war in Bosnia. Norway has contributed both mediation services and financial assistance in Guatemala. Norwegian diplomats have acted as mediators in Sudan, Sri Lanka and Colombia in the early twenty-first century. Norway possesses the second highest GDP per-capita, second highest Purchasing Power Parity per capita in the world, and the highest position in the World on the United Nations Human Development Index (HDI) for the fifth consecutive year. The Norwegian economy is an example of mixed economy, featuring a combination of free market activity and government intervention. The government controls key areas, such as the vital petroleum sector and electricity production. The control mechanism over the petroleum resources is a combination of state ownership in major operators in the Norwegian fields while specific taxes on oil profits for all operators are set to 78 percent. Finally, the government controls licensing of exploration and production of fields. The country is richly endowed with natural resources: petroleum, hydropower, fish, forests, and minerals. Large reserves of oil and gas were discovered in the 1960s, which led to a continuing boom in the economy. Norway has obtained one of the highest standards of living in the world, partly from petroleum production. Norway also has a very high employment ratio. In 2004, oil and gas accounted for 50 percent of exports. Only Russia and OPEC member Saudi Arabia export more oil than Norway, which is not an OPEC member. During the last thirty years, however, the Norwegian economy has shown various signs of the economic phenomenon called "Dutch disease." In response, the Norwegian state began in 1995 to save its annual surplus in a fund now called the "Government Pension Fund" (commonly known in Norway as the "Oil Fund"). The fund is invested in developed financial markets outside Norway. The fiscal strategy is to spend the "normal interest" of the fund each year, set to 4 percent. By January 2006, the Fund was at USD 200 billion, representing 70 percent of GDP in Norway. During the first half of 2006, the pension fund became the largest fund in Europe, totaling about USD 300 billion. Whaling is considered an important part of the culture in coastal areas. Norway's whaling today is limited to the non-endangered Minke Whale, which are killed using explosive grenade harpoons. This has accounted for more than 90 percent of the whale catch in Norwegian waters since the 1920s. Most Norwegians are ethnic Norwegians, a Nordic/North Germanic people, while small minorities in the north are Sami or Kven. The Sami are considered an indigenous people and traditionally live in the central and northern parts of Norway and Sweden, as well as in northern Finland and in Russia on the Kola Peninsula. The largest concentration of Sami people is, however, found in Norway's capital and main city, Oslo. Norway also has a small Finnish community. Like the Sami, the Finns speak a native Finno-Ugric language in addition to Norwegian, but Finland is culturally a Scandinavian country like Norway. In Norway, immigrants are defined as persons with two foreign-born parents. In recent years, immigration has accounted for more than half of Norway's population growth. At the beginning of 2006, there were 387,000 persons in Norway with an immigrant background, representing 8.3 percent of the total population. Immigrants accounted for 13.8 percent of the total population in Norway in January 2017. Like other Scandinavian peoples, Norway's ancestral inhabitants – the Vikings – followed pre-Christian pantheist/polytheist religions. By the end of the tenth century, when Norway had been Christianized, the Norse religion and practices associated with the ancient worship of the Aesir gods were prohibited. Anti-heathenry laws, however, were removed early in the twentieth century. Today most Norwegians are registered at baptism as members of the Church of Norway, a Lutheran denomination of Protestant Christianity which used to be the official state religion. This membership allows one to be able to use services such as baptism, confirmation, marriage and burial, rites which have strong cultural standing in Norway. Other Christian denominations total about 4.9 percent, the largest of which is the Roman Catholic Church. Others include Pentecostals, the Evangelical Lutheran Free Church of Norway, Methodists, Baptists, Eastern Orthodox, Seventh-day Adventists, and others. The Norwegian language has two official written forms, Bokmål and Nynorsk. They have officially equal status meaning they are both used in public administration, in schools, churches, radio and television, with Bokmål being used by the majority. Around 95 percent of the population speak Norwegian as their native tongue, although many speak dialects that may differ significantly from the written language. In general Norwegian dialects are inter-intelligible, though some may require significant effort. Several Sami languages are spoken and written throughout the country, especially in the north, by the Sami people. The Germanic Norwegian language and the Finno-Ugric Sami languages are entirely unrelated. In Norwegian public schools, the most studied foreign language is English and is required for middle and high school-level students. All Norwegian students with immigrant parents are encouraged to learn the Norwegian language. The Norwegian government offers language instructional courses for immigrants wishing to obtain Norwegian citizenship. The difficult economic period that followed independence from Denmark, and the end of an aristocracy to patronize the arts, led to a dark period for Norway's artists, writers, and musicians. Over time, artists returned home from other countries, and native expression became a means of creating a national identity. Landscape artists and photographers, potraitists, and composers returned to Norway and created distinctive styles. Edvard Grieg is one of Norway's, and the world's, most well known classical composers. Celebrating the centenary of his birth in 2007, Grieg is remembered for his musical genius, but also for his great concern for social justice and humanism. Another renowned Norwegian artist, Edvard Munch, is highly regarded internationally for his distinct style and range of ability as a painter, printmaker, and illustrator. Both by virtue of governmental policy and public interest, cultural expression in Norway is taken very seriously. Many artists sustain their livelihood through grants and fellowships from the Norwegian government, and local and national governments are among the biggest buyers of art. The Norwegian cultural outlook is characterized by both a wish to be cosmopolitan and to be distinctly Norwegian. The growing cultural diversity in recent years has added impulses to the various cultural scenes. Dramatic arts - laying claims to playwrights such as Ludvig Holberg and Henrik Ibsen, there are several theaters that offer high quality fare. In addition, there are numerous historical reenactments, especially during the summer months. The history of Norwegian literature starts with the pagan Eddaic poems and skaldic verse of the ninth and tenth centuries with poets such as Bragi Boddason and Eyvindr Skáldaspillir. The arrival of Christianity around the year 1000 brought Norway into contact with European medieval learning, hagiography and history writing. Merged with native oral tradition and Icelandic influence this was to flower into an active period of literature production in the late twelfth and early thirteenth centuries. Major works of that period include Historia Norwegie, Thidreks saga and Konungs skuggsjá. The period from the fourteenth century to the nineteenth is considered a "dark age" in the nation's literature though Norwegian-born writers such as Peder Claussøn Friis and Ludvig Holberg contributed to the common literature of Denmark-Norway. With the advent of nationalism and the struggle for independence in the early nineteenth century a new period of national literature emerged. The dramatist Henrik Wergeland was the most influential author of the period while the later works of Henrik Ibsen were to earn Norway an influential place in Western European literature. In the twentieth century notable Norwegian writers include the two Nobel Prize winning authors Knut Hamsun and Sigrid Undset. Music based on traditional Norwegian form usually includes minor or modal scales (sometimes mixed with major scales), making a sober and haunting sound. Pure major key dance music forms also exist. Prior to the 1700s, there is scant written record of what kind of music was played in Norway, but there is a large aural tradition. In 1380, Norway had come under Danish rule, and thus had no royal house or nobility of its own; as a result, for 450 years, Norway did not participate significantly in the musical development which occurred in royal circles throughout the rest of Europe. Religious and traditional folk music were dominant throughout this era in rural areas, though again scant records exist to document their nature. In the last half of the twentieth century, Norway, like many other countries in the world, underwent a roots revival that saw indigenous music being revived. Norway shares a Nordic dance music tradition with its neighboring countries of Sweden and Denmark, where the Hardanger fiddle, the most distinctive instrument in Norwegian folk music, is used along with other fiddles like the standard violin and Setesdals-fele. The hardingfele was part of kappleik musical contests from the late nineteenth century. Traditional dances are normally referred to as bygdedans (village or regional dance) and include halling, pols, springleik, rull, gangar and springar. These dances, sometimes called "courting dances" were often connected to the important events of rural (farming) life: weddings, funerals and cyclical feasts like Christmas. From its origins about 9,000 years ago to the present, the architecture of Norway has evolved in response to shifting economic conditions, technological advances, demographic fluctuations and cultural shifts. While outside architectural influences are apparent in much of Norwegian architecture, they have often been adapted to meet Norwegian climatic conditions, including: harsh winters, high winds and, in coastal areas, salt spray. Norway's architectural trends are also seen to parallel political and societal changes in Norway over the centuries. Prior to the Viking Age, wooden structures developed into a sophisticated craft evident in the elegant and effective construction of the Viking long ships. Following that, the ascent of Christianity introduced Romanesque architecture in cathedrals and churches, with characteristically slightly pointed arches, barrel vaults, cruciform piers supporting vaults, and groin vaults; in large part as a result of religions influence from England. During the Middle Ages, the geography dictated a dispersed economy and population. As a result, the traditional Norwegian farm culture remained strong, and Norway differed from most European countries in never adopting feudalism. This, combined with the ready availability of wood as a building material, ensured that relatively few examples of the Baroque, Renaissance, and Rococo architecture styles so often built by the ruling classes elsewhere in Europe, were constructed in Norway. 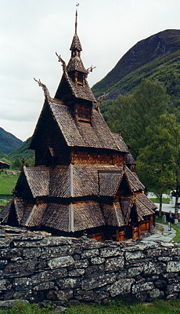 Instead, these factors resulted in distinctive traditions in Norwegian vernacular architecture, which have been preserved in existing farms in the many Norwegian open-air museums that showcase buildings from the Middle Ages through to the nineteenth century; prominent examples include the Norsk Folkemuseum in Oslo and Maihaugen in Lillehammer, as well as extant buildings still in service on farms such as those in the Heidal valley. The peaks of Rondane, seen from the south. ↑ 1.0 1.1 Population 1 January 2010 and 2011 and changes in 2010, by immigration category and country background. Absolute numbers. Statistics Norway (2010-01-01). Retrieved November 17, 2011. ↑ 2.0 2.1 The World Factbook. Central Intelligence Agency. Retrieved November 17, 2011. ↑ Population, Q2 2017 Statistics Norway. Retrieved August 8, 2017. ↑ 4.0 4.1 4.2 4.3 Norway International Monetary Fund. Retrieved August 8, 2017. ↑ Area. Statistics Norway. Retrieved November 17, 2011. ↑ P. Oeding, The black death in Norway, U.S. National Library of Medicine. (translated from the Norwegian). Retrieved August 8, 2017. ↑ Lov om styrking av menneskerettighetenes stilling i norsk rett, LD, Justis- og politidepartementet. (Norwegian language site) Retrieved August 8, 2017. ↑ Lov om gjennomføring i norsk rett av hoveddelen i avtale om Det europeiske økonomiske samarbeidsområde, LD - Utenriksdepartementet. Retrieved August 8, 2017. ↑ Alister Doyle, Norway Has Vast, Inaccessible Seabed Coal – Statoil. Reuters News Agency, December 21, 2005. Retrieved August 8, 2017. ↑ 10.0 10.1 Immigrants and Norwegian-born to immigrant parents, 1 January 2017, Statistics Norway. Retrieved August 8, 2017. ↑ Members of Christian communities outside the Church of Norway Statistics Norway. Retrieved August 8, 2017. ↑ Religious communities and life stance communities, 1 January 2016, Statistics Norway. Retrieved August 8, 2017. ↑ Chad Cohen, Egypt Opens New Library of Alexandria, National Geographic Today, October 16, 2002. Retrieved August 8, 2017. All links retrieved December 13, 2018. Minifacts about Norway, Statistics Norway. Norwegian Laws in English, Lovdata. 100 Best Things To Do In Norway, Jen Reviews. This page was last modified on 14 December 2018, at 20:08.